Although it’s been a while since I backpacked along any of our National Trails – the sort of travels that have in the past prompted me to blog, I have been walking locally, mostly in the historic county of Bedfordshire. Doing so has opened my eyes to the poor state of some of our public rights of way. Sadly there are plenty of paths that cannot be used at all and others that are likely to be lost forever because of the so called “cut-off date” of 2026. The situation is echoed in many counties of England and Wales. The local authorities whose duty it is to protect and care for our public rights of way, generally say that they can’t afford to look after our paths because of “the economic climate” but I feel that is just a lame, convenient excuse. The real reason is that some, certainly my council, do not seem to care. And they can get away with that attitude if the public doesn’t care either, or at least if the majority don’t. Initial contacts with my council to express concern drew little interest leading me to score it as a moderate success if I even received a reply. I now represent the Open Spaces Society and so have a louder voice (I suppose the council might say “bigger mouth”) which will be harder to ignore. If this blog is called Brian Walking then I could have called my new blog Brian Ranting, but I resisted the urge. But that is what I shall mostly do there - rant. Yet I’m keen to give credit where it’s due and hope to find cases to rave about rather than complain. It’s in my nature to resist the urge to be too hopeful on that count though. Meanwhile, I am preparing to get back to the more enjoyable pastime of walking with shelter, rations and the relevant kit on my back. 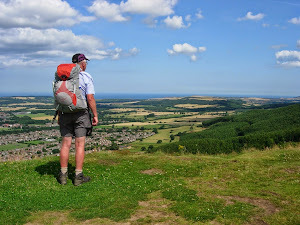 I’m still dreaming about where to go but The Pennine Way will be the major trek next year.